A man of great energy and many talents, Eric Sloane (1905-1985) was a prolific artists, author and illustrator of over 30 books, and an avid collector of Americana. His extensive collection of hand tools is displayed in a building gifted to the State by the Connecticut-based Stanley Works to mark the company’s 125th anniversary. The collection tells a fascinating story about bygone times and the great American heritage of craftsmanship. Sloane’s career as an artist comes vividly alive in his studio, minutely re-created with his paint-spattered easel and rows of jars jammed with paint brushes. Examples of his artworks are displayed in an adjoining gallery. 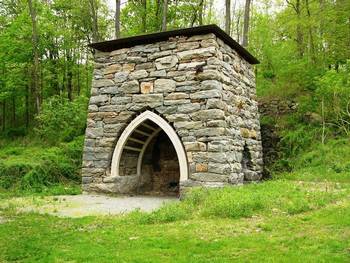 The Kent Iron Furnace, which is on the museum property, began production of pig iron in 1826 and continued for almost 70 years. The remains of the granite blast furnace with its Gothic arches can be seen just below the museum. A diorama explaining the local iron industry is in the museum lobby. The museum and gift shop are fully accessible. The Sloane-Stanley Museum is listed on the National Register of Historic Places & State Archaeological Preserve.